A WestCity gift card is the perfect gift, reward or incentive. Gift cards are available from the Customer Service Desk and can be loaded with any amount from $10–$999. The gift cards can be used at any participating retail store within WestCity. From clothing and department stores to foodcourt dining and cafes, personal services, health & beauty and more, WestCity’s gift card offers something to please everyone. Where can I use my WestCity Waitakere gift card? 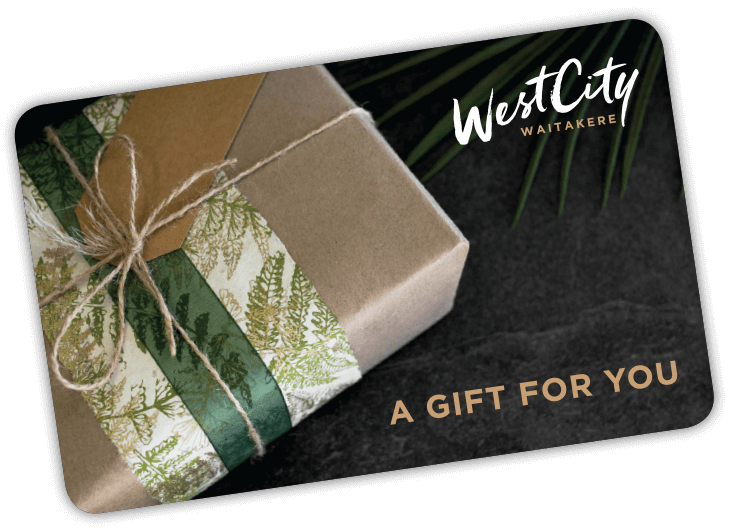 WestCity Waitakere gift cards can be used at most of our participating retailers however, it excludes our banks and Event Cinemas. How long is a WestCity Waitakere gift card valid for? The WestCity Waitakere gift card expires 12 months from the date of purchase. The expiry date is displayed on the back of the Gift Card. For more details please refer to our Terms and Conditions. Where can I purchase a WestCity Waitakere gift card? The WestCity Waitakere gift card can be purchased in-centre at our customer Service Desk on level 2. We accept cash, EFTPOS, Visa and MasterCard as forms of payment. You can also purchase a gift card online. Click here for more information. Can I reload more money onto a WestCity Waitakere gift card? The WestCity gift card can only be loaded with funds once, at the time of purchase. How do I check the balance of my WestCity Waitakere gift card? Click here to check the balance of your gift card or you can visit or you can visit the Customer Service Desk in centre and speak to one of our friendly customer service team members. Can I exchange my WestCity Waitakere gift card for cash? The WestCity Waitakere gift card cannot be exchanged for cash. Can I check the transaction history of my WestCity Waitakere gift card? Yes, you can check the transaction history of your gift card online here or you can visit the Customer Service Desk in centre and one of our friendly Customer Service team members can help you. No, WestCity gift cards are non-refundable if you change your mind. What if my WestCity Waitakere Gift Card is lost, stolen or damaged? If your Gift Card is lost, stolen or damaged please call 09 978 6710 or visit our visit the Customer Service Desk in-centre and one of our staff will help you through the process. View the WestCity Waitakere Gift Card Terms & Conditions.